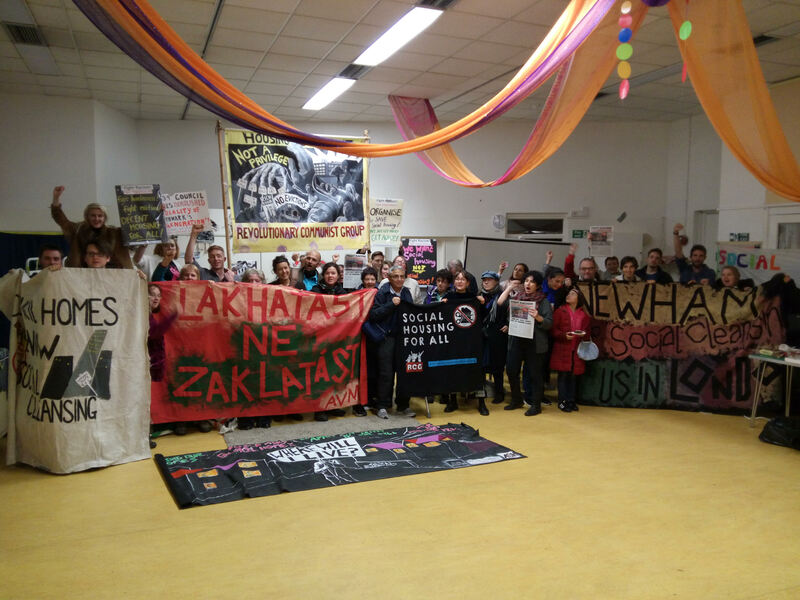 In November 2016 Focus E15 participated in an exchange with Budapest housing activists who are in a campaign called A Város Mindenkiè– The City is for All (AVM). This exchange was organised through the European Coalition for the Right to Housing and the City. 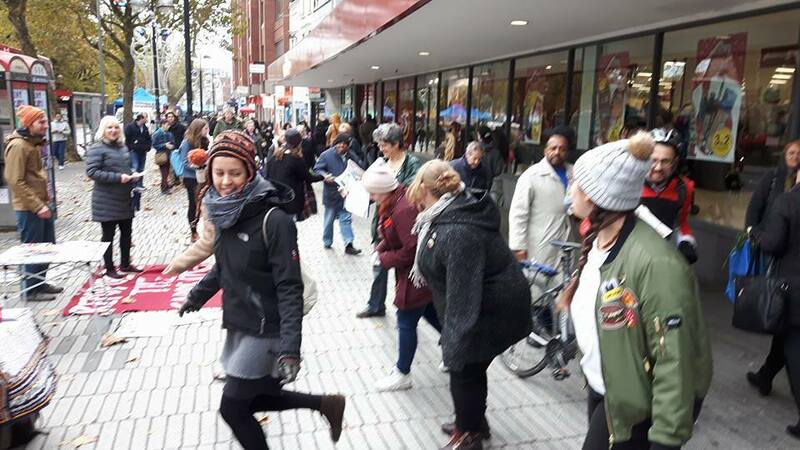 The aim of this exchange, which was the first of its kind run through the European Coalition, was for campaigners in both London and Budapest to share protest techniques, learn new skills and examine our political approaches in the fight for housing. First, AVM activists came to London and participated in various events –in the ‘day-to-day’ life of Focus E15 campaigning. After the street stall, at the Focus E15 campaign meeting, activists from AVM gave a presentation about how their campaign in Budapest is structured. We were impressed to learn that their campaign has been active for 6 years with different sub groups, weekly meetings and street stalls organised on a regular basis. Focus E15 campaign also invited Joel Benjamin from Debt Resistance UK to speak. Joel presented information on how local council are raking up huge debt due to servicing the interest on massive loans. The interpreters were working very hard to ensure that our guests understood the murky details of Newham Council’s finances and how this relates to the sell off of publicly owned housing. 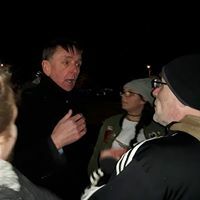 The evening ended with some fireworks as Focus E15 campaign members challenged the Mayor of Newham Robin Wales over Newham council’s appalling housing record. On Sunday, a housing conference co-hosted by Focus E15 and The Revolutionary Communist Group was held in Kings Cross. The housing activists from AVM spoke about their own experience of homelessness and the extent to which the local Municipals in Budapest take children of homeless or evicted parents into care in a matter of hours. This is what they are exposing and fighting against. 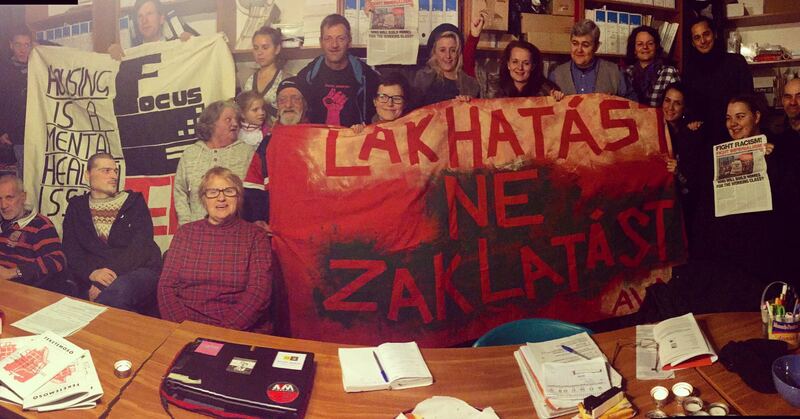 Focus E15 campaigners then spent a few days in Budapest learning more about AVM and housing issues in Hungary. Prior to 1990, state-owned housing in Hungary accounted for 23% of the overall national housing stock, rising to 54% in Budapest and 25% in the cities generally. However, social housing in Budapest has decreased significantly since 1990 when a capitalist government took hold. We spent most of the time in Budapest in District 8, which is close to the city centre. District 8 has a very right wing Mayor who has accelerated the demolition of social housing and the eviction of poorer residents. Various tactics are used by the authorities to evict people from the remaining social housing stock. Residents who are in arrears are removed immediately. Others are offered a buy-out deal for little money. If you refuse this, you are in danger of eviction. And if you have children and you find yourself evicted, your children will be removed and taken into care. Focus E15 campaigners with AVM in Budapest. ‘Lakhatast Ne Zaklatast’ – ‘Homes not Harassment’. We also found out that AVM have been supporting people with eviction resistance. They took us to meet Gizzy, an amazing woman who has been fighting to keep her housing, whilst the Municipal try and push her into an old people’s home – she is in her mid-50s. We spent a great deal of our time in Budapest discussing tactics with AVM. We discussed ways to fightback, the confidence to be explicitly left wing and the need to link clear anti racist messages to the struggle for housing. This is significant in Hungary as the central government is moving down a deeply racist path – this certainly has an effect on the Roma population we met in Budapest. Other issues discussed were should you bring children to a demonstration, or is it too risky? Also, how do you ensure that you are not simply ‘fire-fighting’ individual housing issues, but ensuring people stay involved and are inspired to lead a bigger movement in the fight for housing? If you would like to find out more about our trip to Budapest, see some slides and discuss all these issues more, Focus E15 will be holding a full presentation and discussion at the next campaign meeting on Saturday 3 December, Sylvia’s Corner, 97 Aldworth Road, London E15 4DN, 2.30-4.30pm. All Welcome.